Stepping into the world of betting without knowing how to read odds would be the biggest mistake you can ever make. There would be no betting if the odds didn’t exist and they are arguably the most important aspect of the betting process. Not only do they determine the value of a certain outcome in a match, race or any other (sporting) event you can bet on but betting odds can point towards the probability of an outcome occurring. 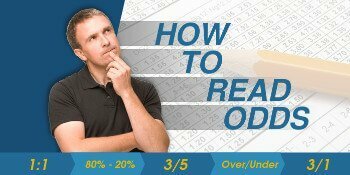 Therefore, learning to read the odds is the first thing you want to do as a bettor. There are several different types of betting odds that are used at various geographical areas. Two of the most common types are the fractional and decimal odds, mainly used at the European continent. You also have moneyline betting odds over on the American part of the world but those are not of interest for this particular article. There are of course other types such as Point Spread or Over/Under aka the Total but the aforementioned two are the most commonly used types for fixed-odds betting we are interested in. United Kingdom and Ireland are two places fractional odds originate from and continue to be used as the preferred betting odds type. Fractional Odds represent the net total that a bettor will receive relative to the stake involved in a bet. The fraction in question stands for the amount of stake that the upside outcome represents. Displayed as 1/2, 5/1 or 7/2, the fractional odds can best be understood in relation to the stake. If you wish to invest £1 on a team valued at 5/1 betting odds, you will end up winning £10 if your selection goes through. On the other hand, if you bet £10 on the 1/2 betting odds your winnings are £5. Ultimately, betting on 7/2 betting odds will see you win £7 and receive your £2 stake back. The 1/2 odds and subsequent forms of a lower-value bet such as 2/7 or 1/10 are referred to as ‘Odds-On’ where you need to invest £2 to win £1, or stake £7 to win £2. Continental Europe is where decimal odds are most commonly spread, but they are used in Australia, New Zealand and Canada as well. They are quite easier to understand and read than fractional odds and are slowly becoming the standardized valuation of a bet with bookmakers around the globe. Instead of dividing the numbers through a fraction and breaking your head with advanced mathematics, decimal odds present you with a simple multiply option to get a look at your potential winnings. Decimal odds are represented through numbers such as 1.50, 2.50, 3.10, 6.00 etc and are simply multiplied by your stake – of let’s say £10 – to give you a clear overview of the winnings which include the stake. So with a £10 stake on the 1.50 odds, you can hope to land a full £15 win (£10 stake and £5 win). The higher the number, the higher your potential winnings. At 2.50 betting odds, your £10 bet will yield a £25 win. It’s £31 on 3.10 odds and £60 on the odds of 6.00.